It’s no easy feat to sell-out an independent venue in the second week of January. With disposable cash usually in short supply after festive excesses and venues looking more towards the pending onset of Independent Venue Week, it’s usually a relatively fallow period. With that in mind, anyone who packs out venue on a Sunday night in Wolverton is clearly doing something right. And with Fontaines D.C. in mind that’s a bit of an understatement. 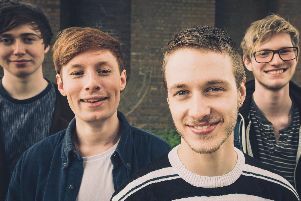 There’s a huge amount of buzz around the Dublin five piece with their headline gig at the Craufurd Arms selling out well in advance Sunday’s gig. Despite only handful of releases under their belt, the quintet are picking up a steady legion of fans following a busy 2018 which featured a mixture of headline gigs, sets at some of the best festivals showcasing new talent and supports slots with the likes of Shame. Joining Fontaines D.C. were Corby trio King Purple have themselves been carving out a decent following over the last 12 months and who put in a solid set featuring past singles Stuck In The Rough and Sound Of Love. By the time Fontaines D.C. arrived on stage the Craufurd Arms was packed to capacity and exploded into life as the band opened with Chequeless Reckless. Fontaines D.C. are a band with no gimmicks, no frills, just five Dubliners exuding an explosive energy, and passion for playing post-punk infused rock and roll with anthemic sing-a-long choruses at a breakneck speed. Frontman Grian Chatten seldom paused to do much other than briefly acknowledge the Craufurd crowd, rather concentrating on ensuring their ten-song set flew past in record time. As he and fellow band members bounded around the stage, influences such as Buzzcocks and The Fall drifted in and out of their raucous sound. Highlights of their set included the excellent Hurricane Laughter and recent single Too Real - which saw fans all singing along to its chorus - and set closer Liberty Belle. From the atmosphere inside the Crufuard Arms, it was clear Sunday was pretty special with the venue again hosting one of the bands hopefully destined for greatness this year.